The cabinet will meet this morning, while the Fianna Fáil front bench will meet before lunchtime. 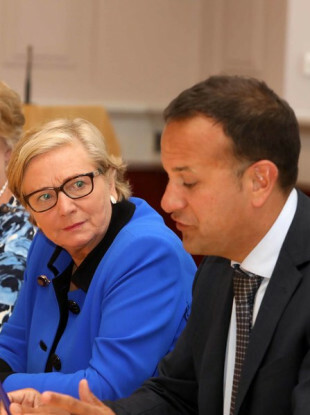 TAOISEACH LEO VARADKAR and Fianna Fail leader Micheal Martin will again meet this morning in last-ditch efforts to avert a Christmas election. The pair have just over 12 hours before a Fianna Fáil motion of no confidence in Tánaiste Frances Fitzgerald is to be debated in the Dáil tonight. Last night the Tánaiste’s former department released information that appears to make things worse for Fitzgerald. Among the revelations in last night’s tonight’s trove of documents was an email from Fitzgerald’s private secretary which says that she had “noted” the email which highlighted a row between the legal team for the then-Garda Commissioner Nórirín O’Sullivan and lawyers for Garda whistleblower Maurice McCabe during the O’Higgins Commission of Investigation. This follows a statement the Tánaiste gave to the Dáil, where Fitzgerald said she did not remember reading the email. Despite this, the government says that its support of the Tánaiste hasn’t changed as a result of the release; the Tánaiste herself has defended her inaction on the information contained in the email, saying that it wasn’t within her remit to prevent that legal approach. The Tanaiste has tweeted that the new documents confirmed that she couldn’t interfere. 2/2 The Tribunal will objectively judge the appropriateness of my conduct. I look forward to giving my evidence to the Tribunal early in January. The Taoiseach and Micheal Martin are said to remain keen to avoid an election in the interest of the country. Canvassers sent out over the weekend were warned that ‘the door will be shut in their faces’ if there’s a Christmas election. However as it stands Fianna Fail’s motion of no confidence in the Tanaiste is due to be debated at 8pm tonight. Email “Varadkar and Martin meet again this morning in last-ditch efforts to avert Christmas election”. Feedback on “Varadkar and Martin meet again this morning in last-ditch efforts to avert Christmas election”.